ULTIMATE CYBERSECURITY. ZERO PRODUCTIVITY TRADEOFFS. Modern mobile workforces rely on technology that enables them to work anywhere from any device. Today’s businesses are also managing more documents and data than ever before. And all that data makes you a target for cyberattacks. Firewalls are no longer enough. Protecting your data from cyber threats without adding layers of cyber security that slow your business down is a real challenge. Only Bulletproof 365 integrates the power of Microsoft 365 cloud productivity solutions wrapped with industry-leading security, unmatched employee education and 24×7 IT support. And unlike traditional offerings, Bulletproof 365 includes all the advanced security features, without making it harder for users to do their jobs. Whether you’re a small business looking for advanced security protection against hackers and other cyberthreats, or an enterprise level organization subject to security audits and strict compliance regulations, Bulletproof 365 provides the most secure and comprehensive productivity solution of them all. Download the Bulletproof 365 Fact Sheet to discover how we integrate Microsoft technology and 18 years of cybersecurity expertise to provide a turnkey peace of mind. 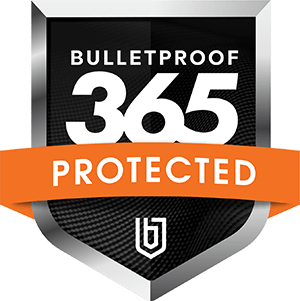 Bulletproof 365 combines the power of Microsoft 365 with leading-edge data protection controls including access management and advanced threat and breach detection to protect against malware, phishing, unsafe attachments and other cyberthreats. We’re a full-service, Certified Microsoft Gold Cloud Productivity Partner with more than 20 million files and 100,000+ users migrated so far. And, nobody knows cloud security like we do. We use our experience to gives you all the tools you need to empower and securely manage a digital workforce. All in a secure Windows 10 operating environment. Our proprietary Security Aware training educates employees on cybersecurity, making them defenders, not cybercrime targets. Our e-learning system also delivers Microsoft 365 training resources to increase user adoption. You can also customize, monitor and update learning programs on an on-going basis. Business is a 24/7 thing. Bulletproof 365 comes with 24-hour bilingual helpdesk support. Whether it’s Microsoft 365 support or another user issue, our experts resolve 80% of service desk calls without escalation. That means your people can get back to work faster. We also consistently score over 90 on the Net Promoter Scale (from -100 to +100). Bulletproof 365 is an integrated solution that is far superior to piecemeal IT fixes and more efficient and cost-effective than subscribing to individual cloud-based products and security management services. We take care of everything from configuration to rollout and ongoing support, making the process simple and seamless for you. It’s turnkey peace of mind with no disruptions to your business. What could happen to your business if you were faced with a cyberattack? You can’t predict when a breach might take place. That’s why Bulletproof 365 protects you 24/7 against increasingly complex and frequent cyber threats. We’re cybersecurity experts with more than 18 years of IT experience. We’re a certified Microsoft Gold Partner, Office 365 Deployment Partner, Microsoft Training Partner and SharePoint Partner. To date, we’ve completed more than 100,000 Office 365 installations and migrated 20 million plus files to the Cloud. We also operate one of Atlantic Canada’s most advanced Security Operations Centres, protecting 70,000 users and 10,000+ devices on 6 continents. Ideal for organizations who are looking to modernize and streamline the way they use technology without exposing themselves to risk. Perfect for businesses with no internal or limited internal IT resources. Designed for organizations who need the ultimate in security and protection. Perfect for businesses subject to compliance and controls audits or ones that simply require absolute peace of mind. Security and productivity are critical, but do you know how to achieve both using the cloud? A new generation of cloud services can enable all controls required by the employer without sacrificing any of the user-friendly features that have made traditional cloud services so popular with employees. This Webinar offers insight into how organizations, just like yours, informed the development of Bulletproof 365 as an answer to some of your most pressing business and IT challenges. Discover how Bulletproof 365’s turnkey IT solution can help you rest easy and achieve your security, compliance, and collaboration goals. Fill out the form to connect with our IT experts now.